As a freelancer, your work skills are the primary considerations for employers to hire you. When you bid for a project, the employer will check on your skills list to see if they’ve found the right match for the job they posted. Although it’s easy to just enter these in your profile, wouldn’t it be better if you have something to back your skills up or prove your expertise level? You can do that by testing your skills. The Skills Lab, formerly known as “Exams,” gives you an entirely new experience for testing your skills. The “Skills tests” will define your credentials and will help improve your chances of getting more jobs. It has just been released to 100% of users, and you might want to take a look at the page. It looks refreshingly good! The Skills Lab offers tests for basic and complex skills commonly needed in online freelancing. You can test your aptitude on various categories like languages, writing, translation, HTML, programming, software architecture, and a lot more. 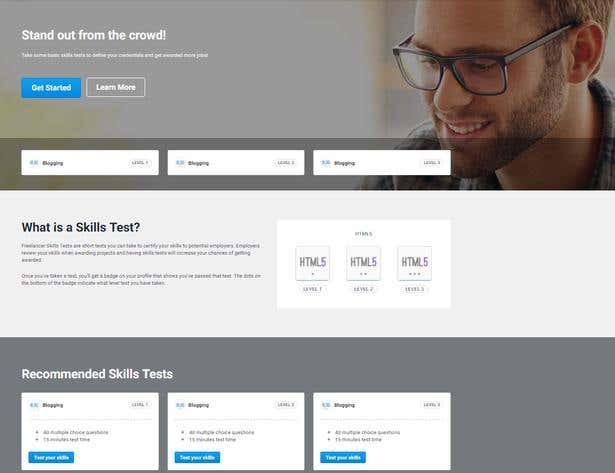 If you choose to buy a skills test, you will be directed to its page which displays details such as the number of questions, test duration, passing percentage, instructions, fee, and more. Each time you complete a test, your profile and bids will display a Skills Lab Badge. You know that badges can help you attract more work opportunities, right? Plus, aside from earning a badge, you’ll also get a chance to polish your abilities. Furthermore, you can also rate the tests to let us know how we can continue improving the system for you. Ready to test your skills? Enter the Skills Lab now!